It’s Friday the Thirteenth, which means I am on the verge of marking two weeks of peace. 13 days. a bakers dozen of peace. Today’s Peace is made from some rough cut pine used as paneling in a small shed. I drew the circle and fuse with a ball point pen and cut it on the scroll saw. 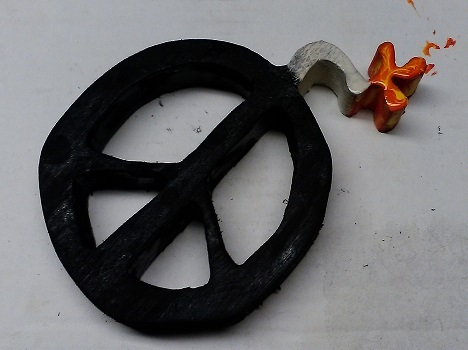 I painted the peace bomb, fuse, and explosion with poster paint. This entry was posted in 365 days of peace, on-going projects, scrap wood, wood working by brighid. Bookmark the permalink.